In the summer of 1988, my mom picked my sister and me up from our summer camp and said that my dad had gotten hurt at work (his foot) and was in the hospital. We were going to go see him, but since we’d be there for a while, she’d take us to the bookstore first. I remember picking out a book, and then on the way to the front, I noticed a whole shelf of Star Trek novels. I grabbed the one with the coolest cover. That was my first exposure to non-YA genre fiction. The book was Diane Duane’s My Enemy, My Ally, still one of my favorites. Since then, I have read hundreds of Star Trek novels across all five series. I used to read every single one, but now I pick and choose. I’ve been pretty judicious lately. However, I decided I’d give the Typhon Pact novels a try, and started with the first one, David Mack’s Zero Sum Game. 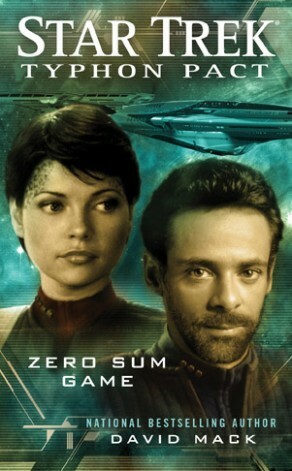 Although marketed as a Typhon Pact novel, Zero Sum Game is really a DS9 book at its heart. It also kind of requires that you’ve read the Destiny trilogy so you know about the characters, and that you’re at least aware of the events in Keith R.A. DeCandido’s A Singular Destiny (read the spoilers; I found the book kind of boring and Mary-Sue-ish). For those who aren’t: Ezri Dax is now the captain of the starship Aventine, and her crew contains folks from DS9 and TNG — including Simon Tarses. The Typhon Pact is a group of traditional Trek enemies that formed in the wake of the Borg invasion chronicled in Destiny; it includes the Romulans, the Tholians, the Gorn, the Breen, the Kinshaya, and the Tzenkethi. I seem to remember the reason for their creation as being pretty flimsy, but that’s neither here nor there. It seems as though the Typhon Pact novels are going to humanize Trek enemies who haven’t gotten a lot of play over the years. First up, the Breen, who speak in machine language and whose faces have never been seen. In the DS9 years, the Breen allied themselves with the Dominion, and that’s really about all you need to know. In Zero Sum Game, Starfleet Intelligence has learned that the Breen are developing a slipstream drive to rival the Federation’s fastest propulsion technology, which is installed aboard the Aventine. Dr. Bashir, who has done a few missions for SI in the past, is tapped to infiltrate the Breen because he is genetically-enhanced, thereby giving him the ability to learn, process, and react faster than your average SI agent. His briefing is conducted by the other enhanced individuals Bashir met during DS9, including Sarina Douglas, with whom he’d fallen in love at one point. He agrees to go on the mission, with Douglas as his partner, and after an overly-convoluted plan to get them inserted into Breen space on the correct planet, they get their — and every Trek fan’s — first view of what the Breen are really like. And that is, by far, the best part of the book. Not the action sequences, not the narrow escapes from death, not the way Douglas overcomes her captors or Bashir fights moral battles with himself over killing, and definitely not the B-plot of Dax trying to keep the Aventine on the Breen border so they can pick up Bashir and Douglas when their mission is complete. All of the plot and action is average Trek, and there’s actually quite a lot of improbable goings-on that seem to work out perfectly for our heroes. Even the ending is pretty unbelievable, and the coda wasn’t as surprising (to me, anyway), as I think it was intended to be. But the Breen… ah, the Breen. I’d hate to spoil it all by saying everything Mack came up with to make them interesting, but the reason they really wear those masks and armor is almost worth the price of admission. As with many Trek novels, there’s plenty of space to explain and describe things that just can’t be covered in a television episode, and Bashir and Douglas’s mission to the Breen world is enough to fill a couple of episodes by itself. The novel is $8, whether it’s electronic or paper, and I’m quite pleased that Mack writes such long stories because there’s almost nothing that annoys me more than paying $8 for something that’s only 225 pages with large print and big spaces between the lines. While all Kindle books use more or less the same font size and kerning, Zero Sum Game is 352 pages in print, so I definitely didn’t feel cheated by paying $8 for it. However, after the heart-wrenching character deaths in SCE: Wildfire and the sweeping grandness of Destiny — probably the best cross-series saga available in the Trek universe — I felt a little let down by Zero Sum Game. I’ll still read Mack’s next book, because he can easily reach the bar he set with Destiny, but I don’t feel as though I needed to read this novel the way I needed to read Destiny or Invasion or The Lost Era. A few last words on the Typhon Pact miniseries: I happen to be the kind of person who can’t stop reading a series once it’s started, so I’ve already bought the second in the miniseries. It’s the Titan entry, and I happen to enjoy the Titan novels — they seem to have taken the mantle of the single-episode novel that TNG and TOS used to have, back in the day. I also understand the concept of needing a Big Boss now that the Borg are out of the picture. I even understand wanting to show us the Trek races we don’t know very well and humanizing them so we sympathize. But I’m not sure the Typhon Pact is a credible enough enemy, and I don’t fear them the way I feared the Borg or the Romulans. Where these books will shine is the exploration of the lesser-known enemy races, and also in the interactions between characters. Mack wrote Dax’s crew as a cohesive unit, and I don’t remember if he invented Lieutenant Kedair but she is definitely an interesting addition to the cast; the way he showed us the Breen was also quite well-done. So far in Book 2, I’m learning quite a bit about the Gorn. I think my problem is that I’m just not as excited about these books as I was for Destiny, or for new entries in New Frontier, or even for stand-alone Trek novels like in the 90s and early 2000s. And I think that really does a disservice to both Star Trek and to the novelists they’ve tapped to write these books — Mack, Michael A. Martin, David R. George III, and Dayton Ward, who have written some really great Star Trek fiction in the past. Perhaps when taken as a whole, after I’ve read them all, the Typhon Pact miniseries will feel like a complete storyline and I’ll feel better about recommending the entire series. But not yet.